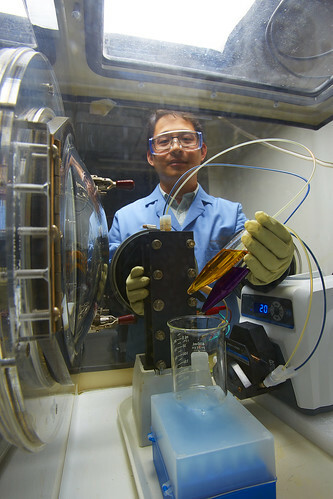 PNNL researcher Xiaoliang Wei prepares a small demonstration organic flow battery. 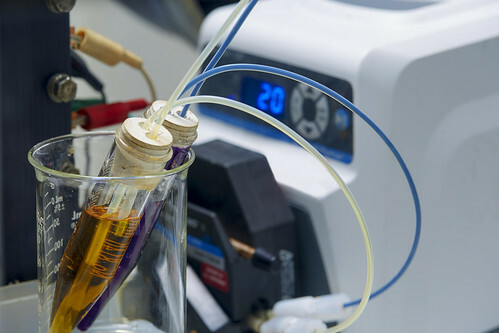 PNNL's all-organic aqueous flow battery uses two inexpensive and readily available electrolytes, one containing methyl viologen and another with 4-HO-TEMPO. RICHLAND, Wash. — Energy storage system owners could see significant savings from a new flow battery technology that is projected to cost 60 percent less than today's standard flow batteries. Both flow and solid batteries, such as the lithium-ion batteries that power most electric vehicles and smartphones today, were invented in the 1970s. Lithium-ion batteries can carry much more energy in a smaller space, making them ideal for mobile uses. The technology gained market acceptance quickly, for both mobile uses like cell phones and larger, stationary uses like supporting the power grid. REFERENCE: Tianbiao Liu, Xiaoliang Wei, Zimin Nie, Vincent Sprenkle, Wei Wang, "A Total Organic Aqueous Redox Flow Battery Employing Low Cost and Sustainable Methyl Viologen (MV) Anolyte and 4-HO-TEMPO Catholoyte," Advanced Energy Materials, Nov. 30, 2015, DOI: 10.1002/aenm.201501449.